I’m so into soft boiled eggs. 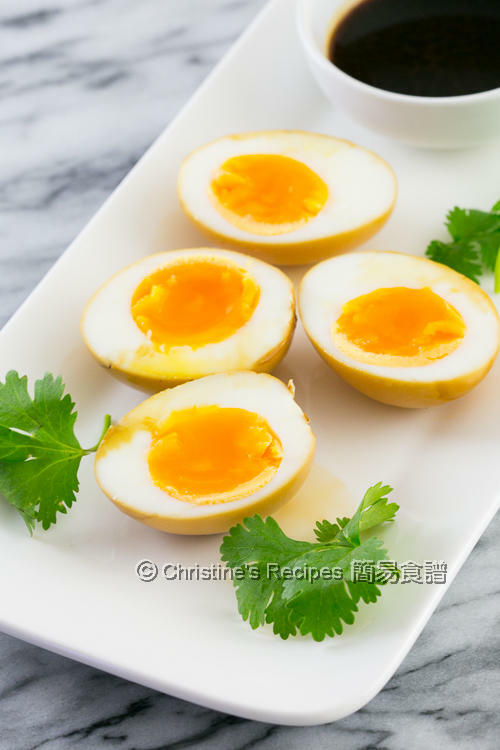 The creamy yolk, a bit running inside the tender egg white is the charming part. It’s best to get organic or free range eggs as they are more flavoursome. 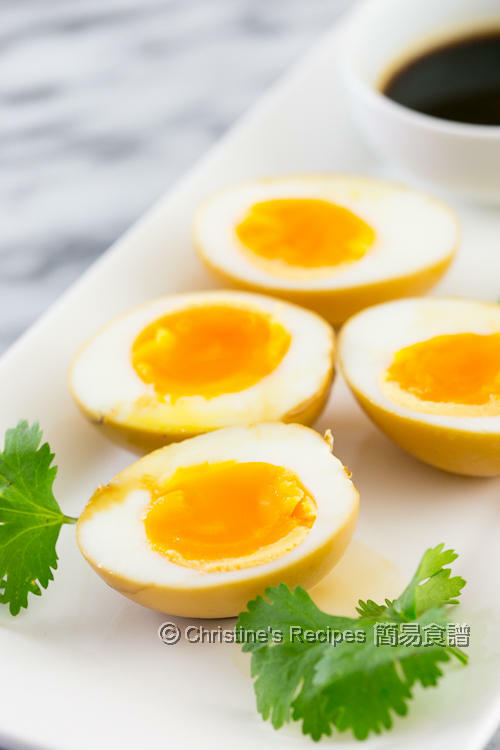 When it comes to making soft boiled eggs, it’s not that difficult as you thought once you get the exact cooking time right. I did several test runs with my Instant Pot (electric pressure cooker) to cook eggs. Armed with the pressure cooker, it’s no fuss at all to get that kind of yolk I like. All I need to do is to stay on the spot and get myself ready to retrieve the cooked eggs out from the cooker and soak them in cold water immediately. The shells can be removed very easily. The spicy sauce that the boiled eggs are marinated with is tasty, just like those ramen eggs you enjoy at Japanese restaurants, but enriched with more fragrance. Put all the sauce ingredients in a small saucepan. Bring it to boil. Transfer to a large bowl and let it cool down completely. Pour in 1 cup of water into Instant Pot. Carefully place the eggs on a trivet, not getting them cracked. Close lid with release handle to “sealing” position. Press“steam”button, high pressure cooking for 4 minutes. Immediately press“cancel”button and quick release. Transfer the eggs into a large bowl of cold water in order to stop the residue heat from cooking. Let the eggs cool completely. Remove shells. Rinse with water. Soak the eggs in the spicy sauce. Cover and put in fridge. Marinate for least 2 hours. As the eggs will float on the surface of the sauce, take them out from fridge and flip to the other side in the middle of marinating with a spoon. Serve as snack drizzled with spicy sauce, or in noodle soup. Enjoy! It’s very important to take out the eggs once the “steaming” time is up and run quick release. If leaving the eggs a bit longer, the heat inside the pot will continue cooking, then you won’t have yolks running, but fully set. Well, it’s not a big deal though. The eggs are still very delicious. wow those eggs are so perfectly cooked. I love this machine too. Will keep more IP recipes coming for sure. Thanks for sharing this recipe! Is it possible to get the same effect if we boil the eggs or use a steamer? 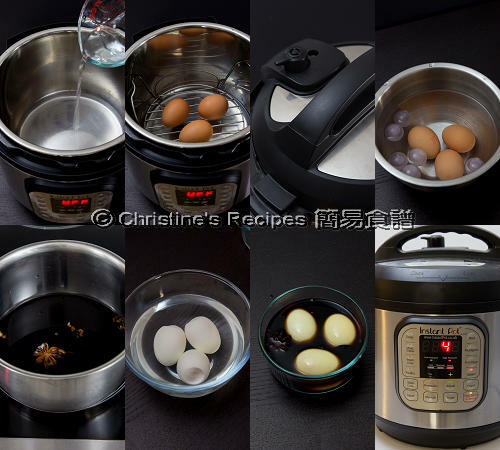 Sure, you can boil or steam eggs and get the same result if getting the right cooking time.